Compost can help your soil structure and soil health, and make it easier for healthy roots to grow. It is usually not high in nutrients, so it cannot be used as a fertilizer. Credit: SSSA staff. 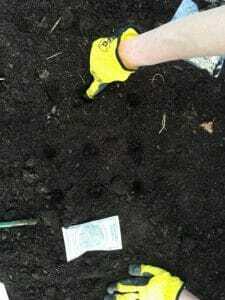 April 15, 2019 -Adding compost to a garden is a good idea. But, like most things in life, is it best to do it in moderation? To answer that question, you need to understand what you are adding and why. Improves soil fertility. The well-decomposed organic materialwell-decomposed organic material in compost supplies essential nutrients for plant growth. This includes nitrogen, phosphorus and potassium, as well as micronutrients. Improves soil structure. Compost adds a stable form of organic matter to the soil. That increases the moisture holding capacity of the soil. It can also improve soil that is too sandy, or has become compacted. Improves soil health. Besides improving soil fertility and structure, compost contains beneficial microorganisms. These soil microbes make nutrients more available to plants. They also suppress pathogens in the soil because of the number and activity level of the beneficial organisms dominates the soil environment. From that summary you might wonder “well, why wouldn’t my garden need more compost?” All these benefits of compost are good for a garden, of course, so the answer really depends on the needs of your individual garden or lawn. Every plot will have different soil types, nutrient levels – and maybe even different pH. We always recommend a soil test to determine the appropriate soil amendments for your yard – and your gardening goals. A productive garden requires plant nutrients, water, soil that is a good rooting environment, plenty of sunshine and weed and disease control. Soil fertility. Well-composted yard waste, and even composted manure, has a low nutrient content. The amount of necessary nutrients (nitrogen – N, phosphorus – P, and potassium – K) found in compost is typically around 3-5 percent of the total weight. (Off-the-shelf fertilizer ranges for each of these nutrients are from 10 to 20+ percent). This means that as an addition to the soil, compost will act like a weak fertilizer. Different composted materials will have slightly different nutrient contents. If you make your compost from lawn clippings and leaves alone, it will be lower in nutrients than if you add scraps from your kitchen waste (like vegetable and fruit discards, egg shells, and other safe-to-compost materials). Depending on your compost mix, adding compost may not meet all the nutrient demands of your garden. Crops like corn and tomatoes require more nitrogen than do beans and carrots. Phosphorus and potassium are also required in large quantities for leafy vegetables. That means that supplemental applications of fertilizer (organic or inorganic) may be needed. The thing to keep in mind is that compost is a limited source of nutrients, but it does help retain nutrients in the soil. The best way to know if your garden soil would benefit from added nutrients is to have the soil tested. Soil structure. This one attribute of compost where you could, in theory, over-apply. There are some simple tests you can do by looking at, digging and touching your soil to help you determine the texture of your soil. Once you know if your soil is too sandy or has too much clay, you can take steps to help build soil structure. Sandy soil is easy to treat with compost. And, adding compost helps this type of soil retain moisture and build up the nutrient supply. But the story is different for soils with a lot of clay. Clay soils are often poorly drained, and adding too much compost can make the problem worse (remember, compost helps soils stay moist!) For example, the soil in my garden has a lot of clay. There is one area that is easy to work when it is dry, but, during the spring when it rains, it puddles on the surface and drains very slowly. This is a spot with poor soil structure that will benefit from adding compost for a few seasons. An extra step would be to keep the soil covered with mulch, to allow water to infiltrate during rainfall and to slow evaporation so water is available for plants when it turns dry. Soil health. Soil microbes (bacteria, fungi, etc.) should all be in balance for a soil to be healthy. Just like in your gut, “good” soil microbes often keep disease-causing microbes in check. Active organisms associated with composted organic matter will compete with diseases in a healthy garden soil. To observe this in the garden, evaluate if the soil is easy to dig. If it is, and you find plenty of earthworms, this is an indication of good soil health. Earthworms will multiply in a soil that has adequate organic matter, is well aerated and has actively growing plants. Compost helps to create such an environment in your garden and the earthworms will help maintain that and help you know that the soil is biologically active. So, how do you know if your garden needs more compost? If compost will help you improve the health and physical condition of the soil, then adding more is a good management option. If your soil is deficient in any plant nutrients, then compost alone will not correct that deficiency. But, it will help to retain nutrients and create a rooting environment where plants can grow. Adding fertilizer in combination with compost may be needed to have a healthy, productive garden. Finally, if your soil structure needs some work, compost may – or may not – be the right solution.